Photos courtesy of Marissa Brewer. If you’ve ever seen “Pitch Perfect,” you’ve indirectly heard of the ICCA, the International Championship of Collegiate A Cappella. 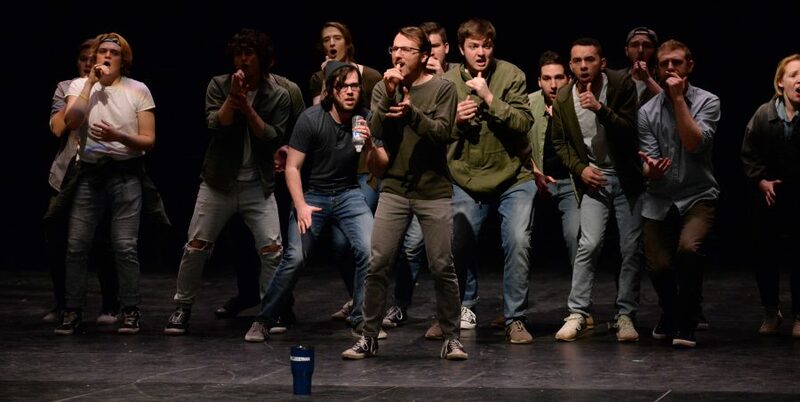 The movie is based on the ICCA competition—and West Chester University had the pleasure of hosting 10 a capella groups for the Mid-Atlantic Quarterfinals on Saturday, Feb. 16. I step into the concert venue, Asplundh. The lobby is full of supportive family members with flowers and Kodak cameras prepared. Performers are decorated in mostly black with accents of color, shaking with excitement. After I get scanned in, I rush to my balcony seat, and the lights flicker to cue five minutes until show time—it’s not my first rodeo. A high-energy a capella host hops to the stage with a more soft-spoken counterpart to welcome the first group to perform: Chromatic Expansion from Millersville University. 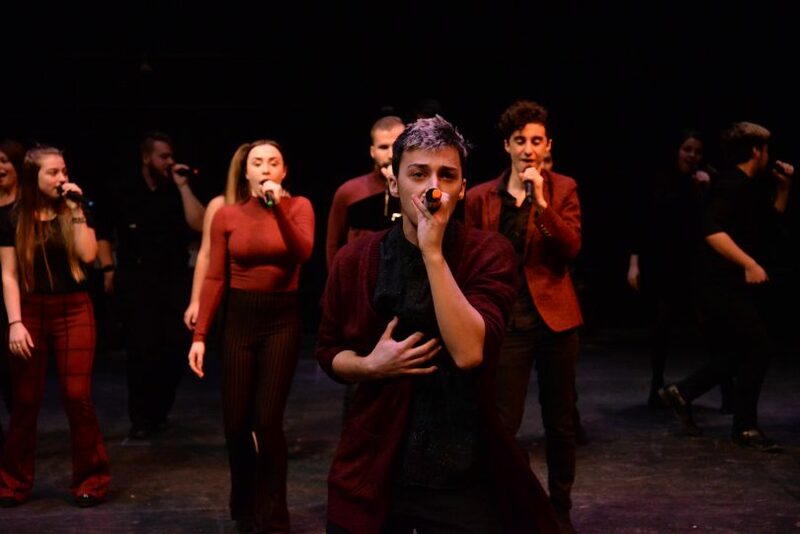 Up next, West Chester University’s gender-inclusive tenor and bass A Capella group, High Street Harmonix, takes the stage from left and right with high energy. The group starts into a familiar song to me: “Say Amen (Saturday Night)” by Panic! At The Disco—and the first soloist, Kyle Loedel, who later wins best soloist, kills it. One of the best parts of the performance is the radically different voices being showcased. Loedel exudes a very natural and effortless sound. James Saracina, the second soloist, lets out a raspy and passionate performance on an alternative track. The third soloist, John Leiderman winds down with a gentle sound, and the fourth soloist, Matt Jung, shocks the audience with a crazy vocal range. Underneath it all, High Street Harmonix showcases their talented vocal percussionist, Andrew Bollenbach, who is awarded for best vocal percussion of the night. Every transition is effortless. Choreography includes a lift. Lights set the mood for each new track. The High Street Harmonix definitely made waves with their presence. When Off the Record, one of the co-ed groups from Lehigh University, takes the stage, the set gets off to a little bit of a rocky start in terms of balance between voices of soloists and backups with the recognizable “Lady Marmalade.” Although, the group quickly finds their footing before the second soloist, who sounds like Sam Smith, begins the next song. Throughout the duration of the set, cut-offs are crisp, and dynamics are effective. The final song showcases a passionate performance of “Ultralight Beam,” by Kanye West, and the last chords of the arrangement ring out into the space of the auditorium before the group struts off the stage, leaving the audience a feeling of wanting more. Another group from Lehigh University takes the stage, the set gets off to a little bit of a rocky start in terms of balance between voices of soloists and backups with the recognizable “Lady Marmalade.” Although, the group quickly finds their footing before the second soloist, who sounds like Sam Smith, begins the next song. I am not disappointed, as the first soloist does great justice to “breathin” by Ariana Grande. It’s not easy to contribute to a deeper sound in an all-female group, where the exceptional performance comes from hitting high notes. However, the soloist performance of “Like a River” delivers the lower register representation that the audience didn’t know it was craving. If you’re about to perform Queen, you have to leave an impression. It’s bold to perform Freddie Mercury. However, Vocalign makes the audience giggle when a smaller male performer taps the shoulder of the female vocalist to take over the solo right before the high note. It was unexpected and honestly, impressive. Last, but certainly not least, Under A Rest owns the stage. No other group sends sound bouncing off the walls quite like they do. Not to mention, the choreography is the most complicated and energetic out of the groups. It doesn’t come as a surprise that John Bilcik was praised for his sharp moves when he is awarded for best choreography. The soloist, Bram Baumstein, sings “still feel.” by half alive and belts it as if it were written for him — and it was. Spencer Camacho is awarded for best arrangement. 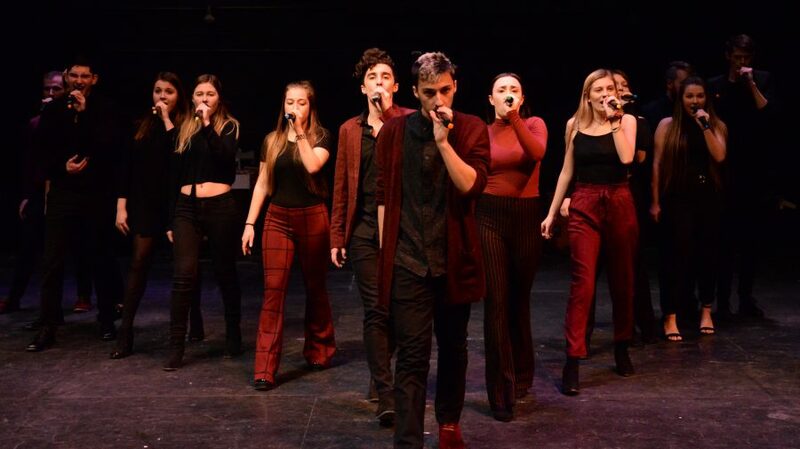 After a lengthy performance from a non-competing a capella group, featuring the two hosts, it’s no surprise that Under-A-Rest is announced as the first-place winner of the Mid-Atlantic Quarterfinals and High Street Harmonix as second. Vice President of Under A Rest John Bilcik admits after the award ceremony, “I think surreal is the best word to describe the feeling of winning. A lot of the process feels like a shot in the dark, since we’re only in front of an audience when it counts.” It’s pretty evident that their shot was a hit. Both groups move to semifinals and I can’t wait to see what else is in store for these talented bunches!